You can control your Impression FX presentation using a keyboard and mouse or a touch screen. 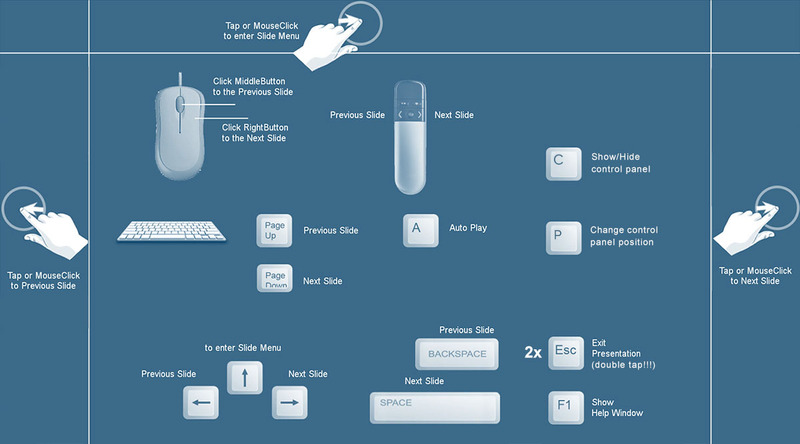 Controlling the presentation using your keyboard and mouse is very similar to controlling a presentation in PowerPoint. Controlling the presentation using a touch screen is intended for tablets, touch screen laptops and various touch screen kiosks and panels. To see all options for managing your presentation during viewing, press the F1 button on your keyboard or click on the lower left corner of the screen and press the question mark button. You should click when there is no transition to the next slide.